The Greenpeace ship, the Esperanza, is set to leave Falmouth in Cornwall on Thursday to monitor pair trawling. The charity claims unless this type of fishing is stopped, dolphins in the channel could be wiped out completely. Pair trawling has been banned within 12 miles of the British coast since September 2004. Last week Greenpeace mounted a legal challenge in the High Court to extend the ban to 200 miles. Greenpeace's Ocean Campaigner, Sarah Duthie, said the current ban did not go far enough. She said: "The UK Government committed to closing the sea bass pair trawl fishery within a 12-mile zone. "Most of the trawling happens outside that area and the highest incidence of the dolphin bycatch happens outside that area. "This is not an effective measure." Fisheries minister and Exeter MP Ben Bradshaw said when the ban was introduced it was a significant start which should have a positive effect on reducing the number of dead dolphins. 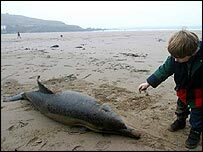 More than 300 dolphin and porpoise carcasses were found on beaches in the South West in the year 2002-2003. Pair trawler crews have always denied they are responsible for the mammals' deaths.